The Solio Xcellerator + Hub Battery Pack + Solar Charger bundle delivers a rapid charge from the sun, even in low light conditions. 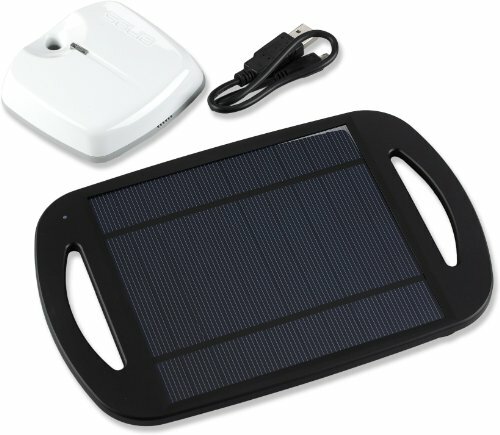 The easy-to-operate charger can be powered up from either solar energy or from any USB port. It powers USB-rechargeable smartphones, tablets, e-readers, MP3 players, GPS watches, cameras, water purifiers, bike lights, headlamps and lanterns. Apple output mode is optimized for Apple products; CTIA (Cellular Telecommunications Industry Association) output is optimized for most other devices. Simple and fast-charging 2,000mAh li-poly battery stores energy for up to 1 yr., making it a great addition to any emergency preparedness kit. The easy-to-operate charger may be powered up from either solar energy or from any USB port. Simply plug into your electronic device and press a button to start charging; status-indicator LED on button shows the battery's power level. Approximate charge time for the HUB Battery Pack is 4 - 6 hrs. direct sunlight and just over 4 hrs. from the USB charging cable or from a power outlet. The high temperature-rated battery, internal heat-sink, white color and heat-dissipating design help ensure that the HUB operates in high heat of solar charging. Fully charged battery offers 1.5 - 2 charges for smartphones, 50% charge for e-readers, 25% top-off for tablets and multiple charges for smaller battery capacity devices. Enjoy the confidence that your devices will have power whenever and wherever you need it. If you have any questions about this product by Solio, contact us by completing and submitting the form below. If you are looking for a specif part number, please include it with your message.